Come and see why Hugh McCann’s Newcastle Co.Down is one the fastest growing Boutique wedding venues in the North! 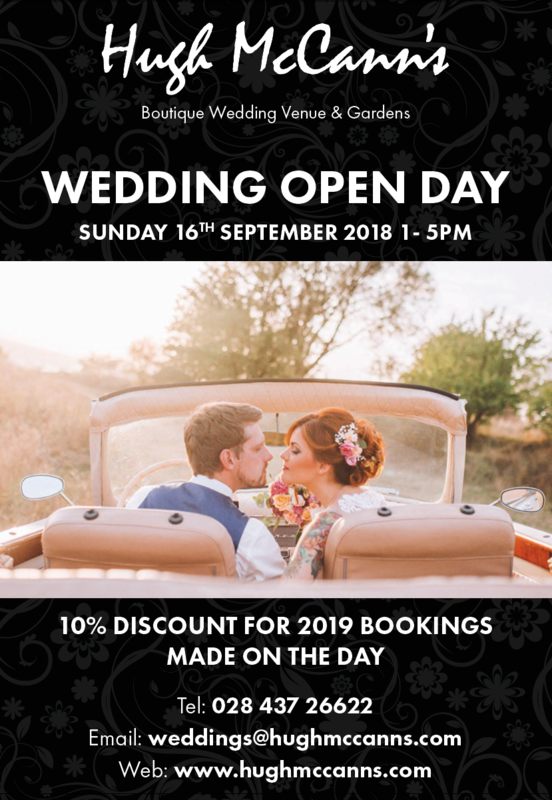 Join us on Our Wedding Open Day Sunday 16th September 2018 from 1-5pm and witness for yourself the breathtaking views of Dundrum Bay and the tranquillity of the Mourne Mountains. Begin your journey through our lavender lined gardens and envision your own ceremony within the grounds of Turloughs’ secret garden. Upon arrival, have a glass of bubbly on us and enjoy a guided tour through the building. With various wedding packages on offer including; the option of Our New ‘All inclusive wedding package’ or Wedding Packages starting from just £995, we cater for all parties, big and small. Plus grab a sneak peek of our Newly Renovated Coast Suite and receive our gift to you, 10% off all 2019 Wedding dates booked on the day with a deposit!